How does FAAB bidding work? FAAB bidding provides you with a budget during the season for free agents, and uses a blind bidding process to select people off free agency each week. The highest bidder for each player wins the claim! The default budget is $100, but the commissioner of a Private League can adjust the budget as they see fit. In the event of a tie, a continuing rolling list waiver priority order is implemented for the tiebreaker, based on draft order. If you waiver a player at all, you go to the end of the list. If you make any free agent acquisitions, it will not effect this priority order. The minimum bid on any player is $0. 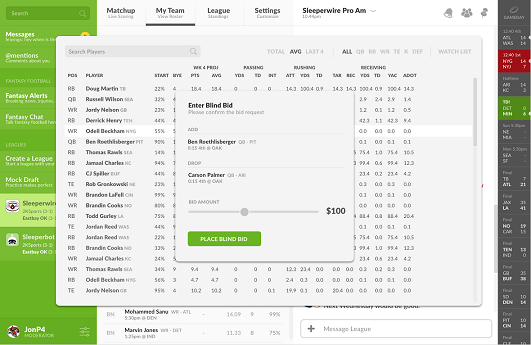 The commissioner can set anybody's waiver budget via the mobile app by going to a team's roster from the standings and scrolling down to the bottom. There will be an option to edit FAAB budget there.